You know Woody and Buzz, don’t you? Woody and Buzz from Toy Story, the first of the full-length Pixar films which debuted in 1995. We’re continuing the trend of using cartoon character names for our newest beehives, which began with our older and original two hives, Scar and Mufasa, named after characters in The Lion King. 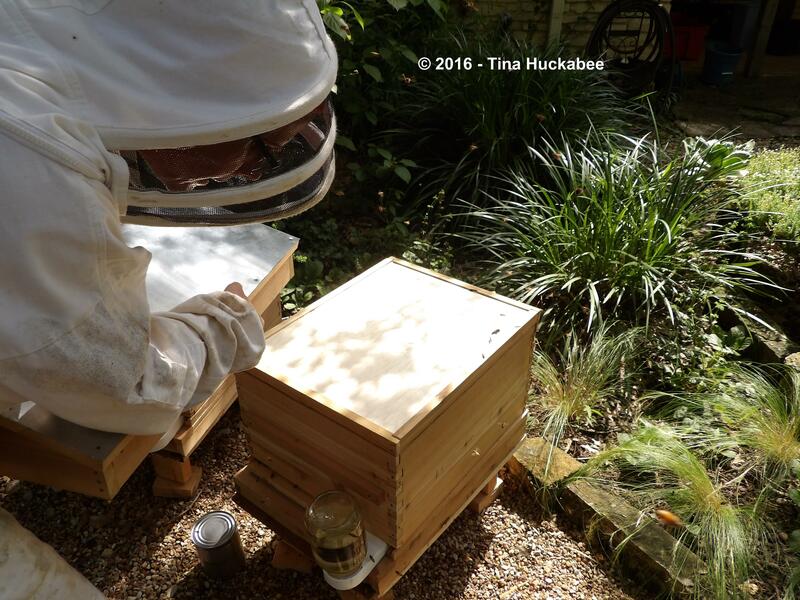 Mufasa the Hive died in December due to an infestation of varroa mites, but Scar is buzzing along just fine. In fact, we took three (heavy!) combs of honey from Scar this past weekend. 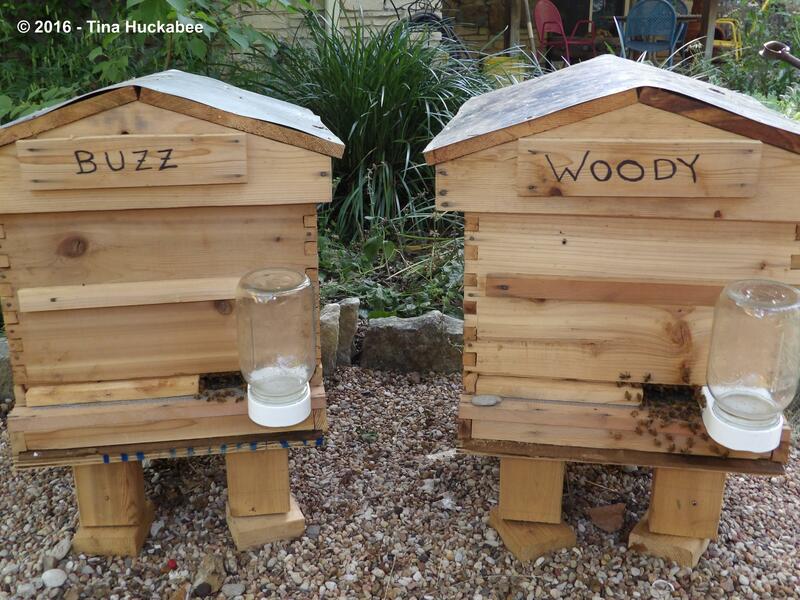 Buzz and Woody are Langstroth hives. 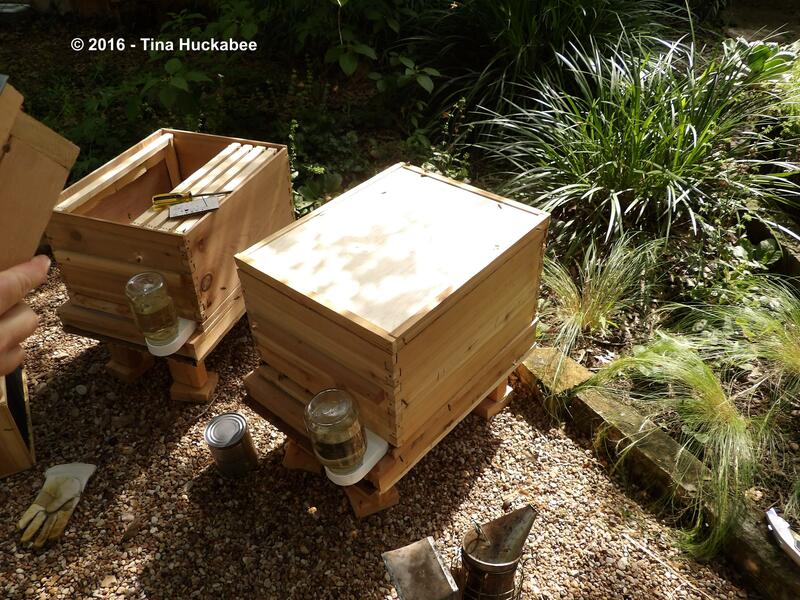 I’ve written about our travails with Scar and Mufasa–both Warre hives–and we’ve been planning two new Langstroth hives for quite a while. Langstroth hives are considerably easier to work with and we finally hived these babies a month ago. 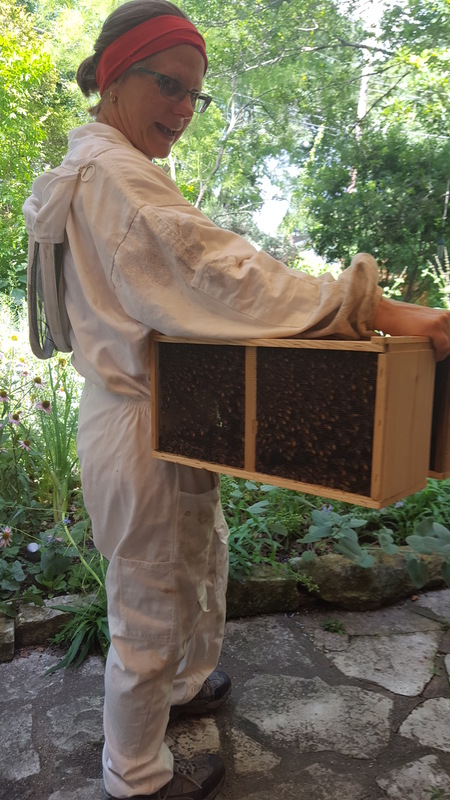 We were planning to hive them in April, but a serious bicycle accident two days before the hiving waylaid Bee Daddy for a time and it was only recently that we finished final touches on the hives and then picked up our new bee-gals. 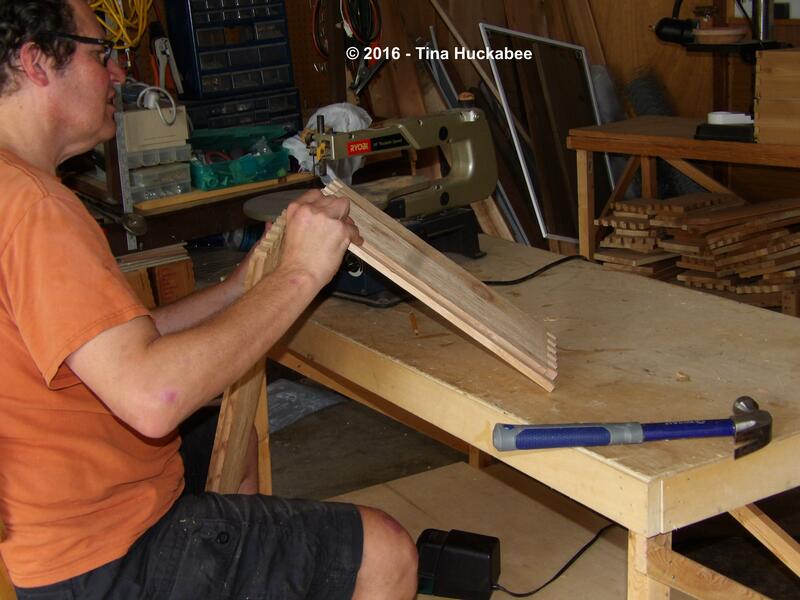 I now understand why Langstroth hives are the industry standard–they’re SO much easier to work with than the Warre hives. …and firing up the smoker. 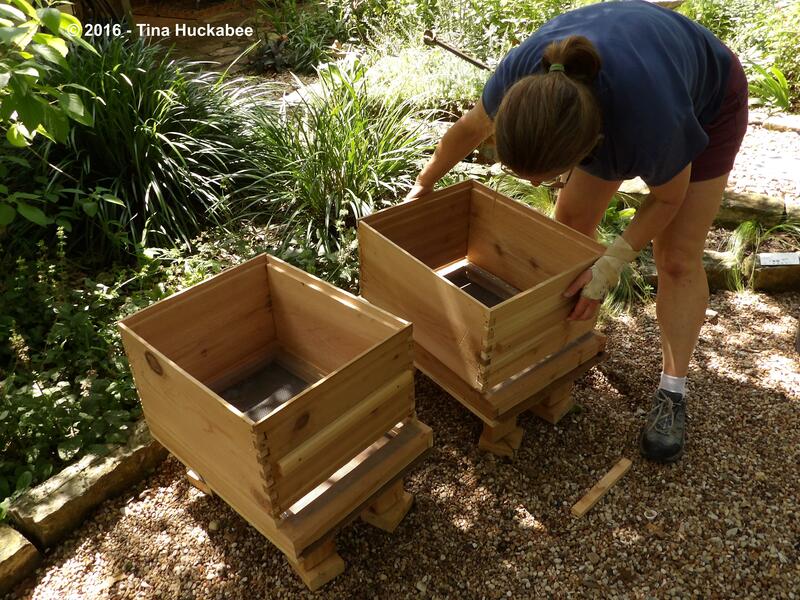 …which fit together with ease, coupled with the larger boxes that they’re placed in, make this beekeeper’s life much easier. 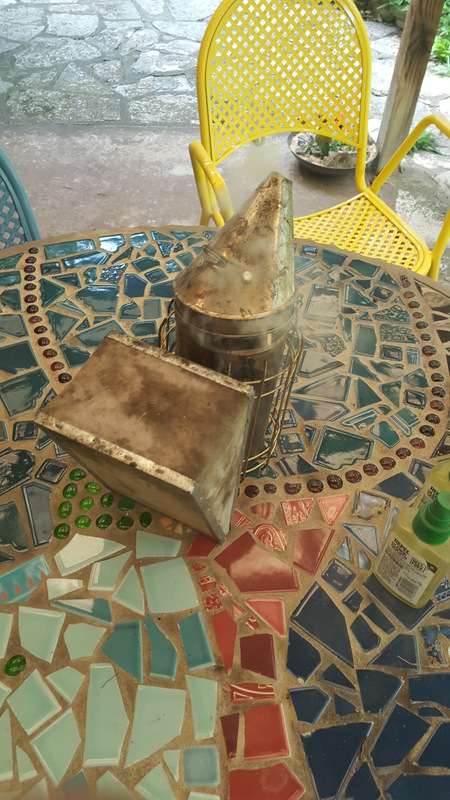 Warre hives Scar and Mufasa were great learning tools and truthfully, we were fairly successful with them–we’ve had darling honeybees and their queens made other darling honeybees and the whole bunch-a-bees made oodles of gooey, delicious honey. 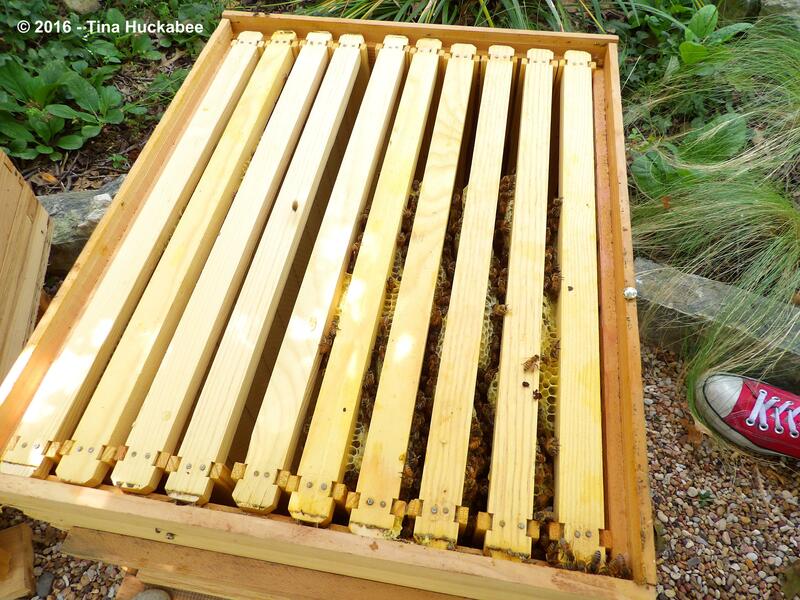 But the cramped conditions of the smaller hives, along with top bars rather than frames, made things tricky these past two years as we kept tabs on our bees or when we pulled honey out of the hives. 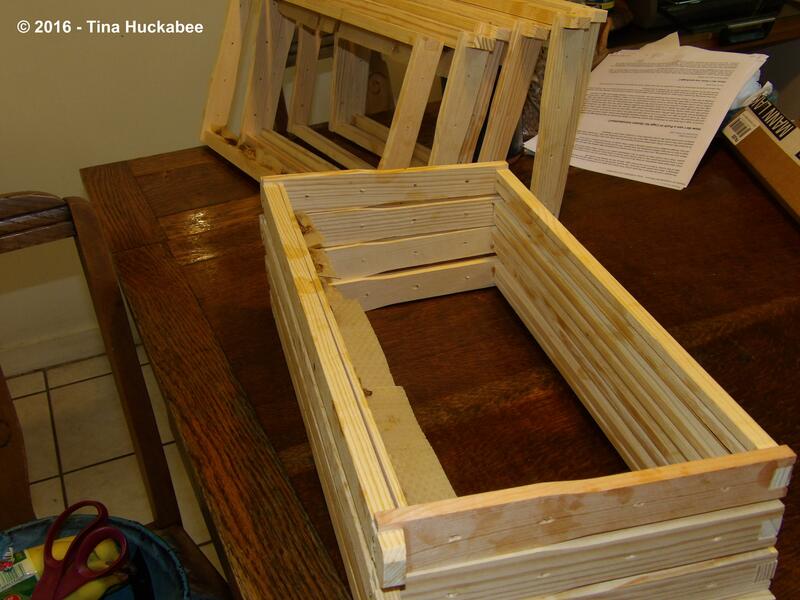 So we did what others before us have done and transitioned to Langstroth hives. 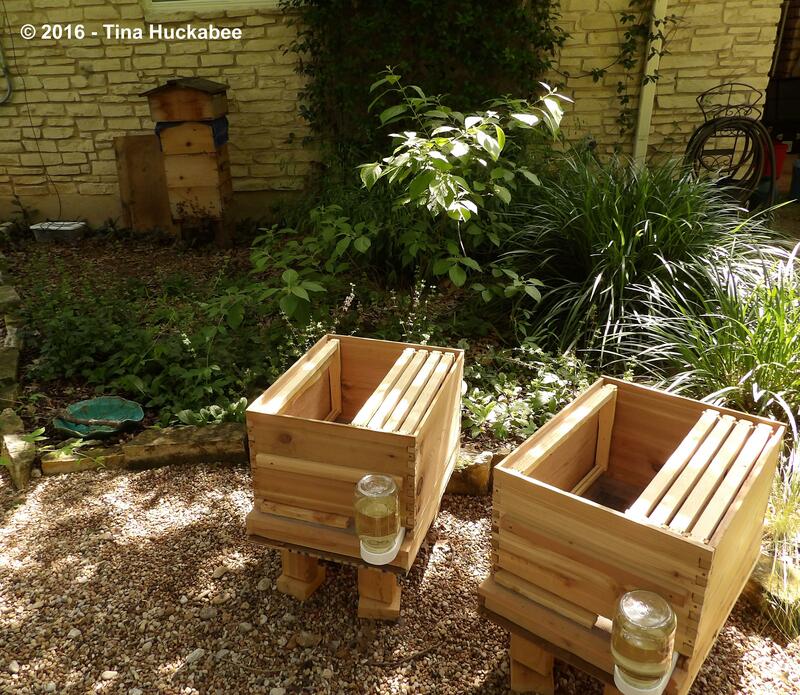 …I was arranging our bee “yard” for the new ladies. Meanwhile, the Buzz and Woody bee gals were sitting on the living room floor, stuck in their cages, no doubt annoyed and tapping their tiny toes, anxiously awaiting their new homes. 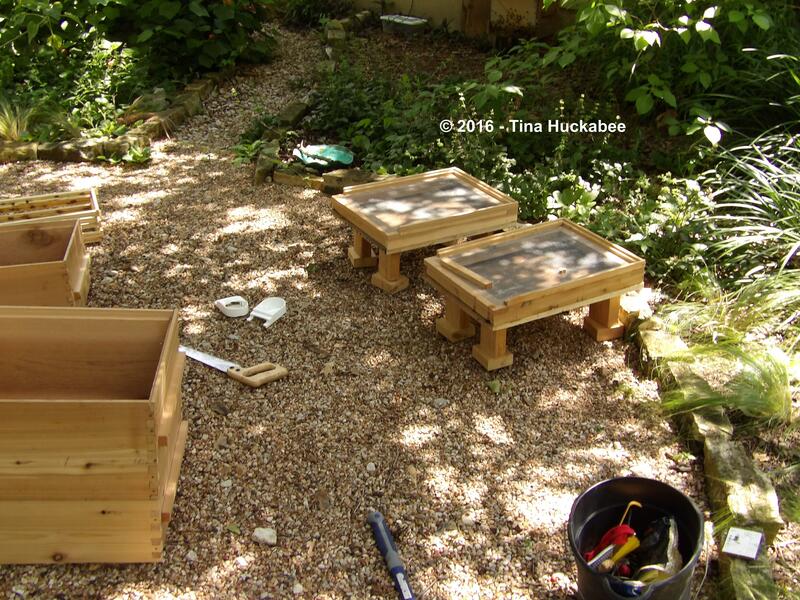 Putting together the hives, we start with a plinth which has a screened bottom board, which will make it easier to check for the dreaded varroa mites. I set each brood box atop each plinth. 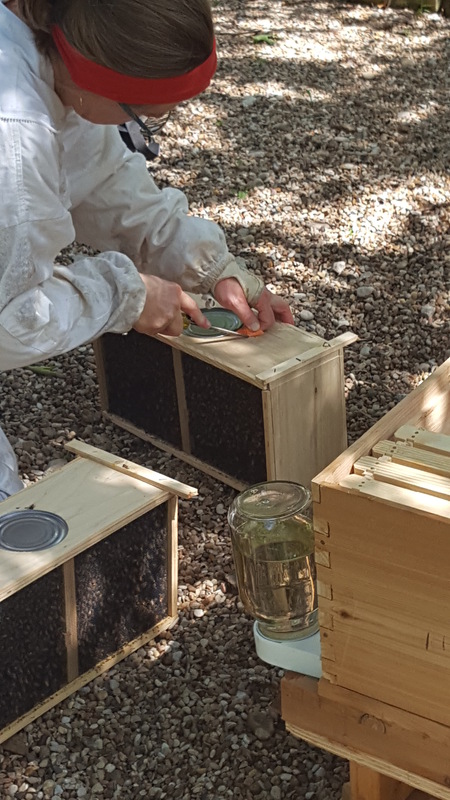 Per instructions, we placed four brood frames (where the worker bees build their honeycomb and make honey, and the queen lays eggs) on one side in each box. We added the outside boardman feeders already filled with sugar-water syrup at a 1:1 ratio. 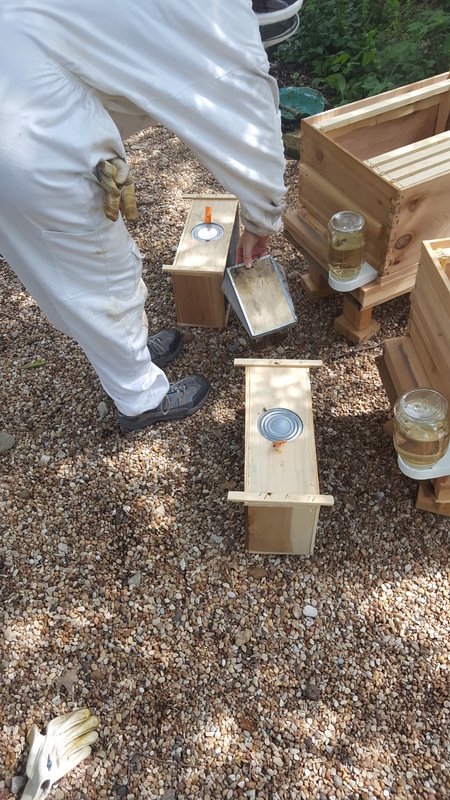 Most beekeepers use trough feeders located inside the boxes, but we’ve used the boardmans and prefer not to open the hives each time we add fresh sugar-water. 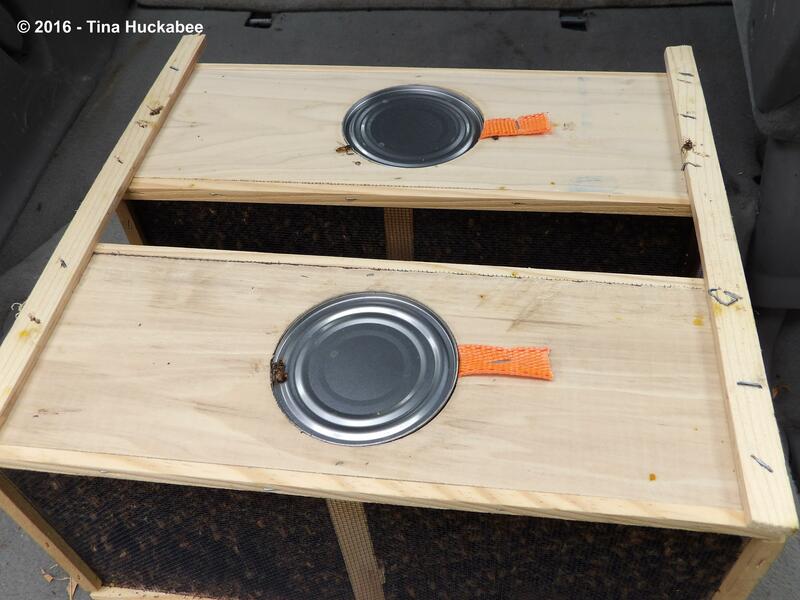 …which also holds the queens’ cages, attached with the orange tabs. 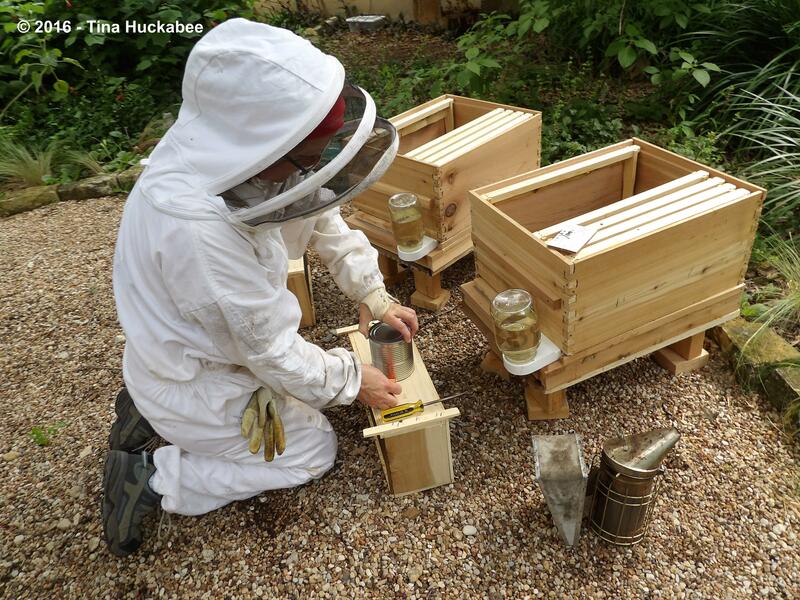 Queens from commercial apiaries usually arrive in their own separate cages from the workers. 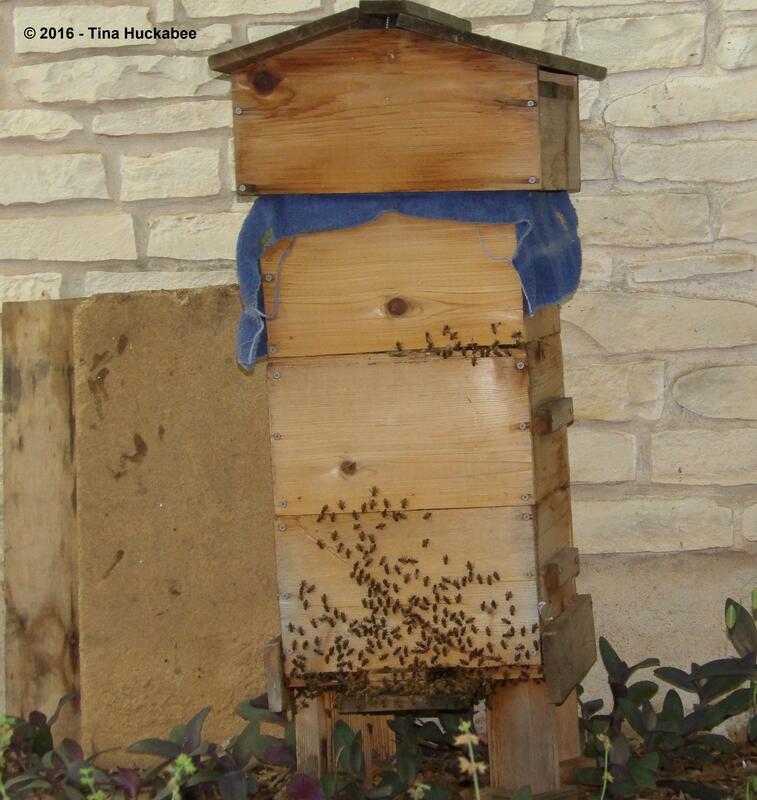 Our bees come from BeeWeaver Apiaries, located here in Texas. 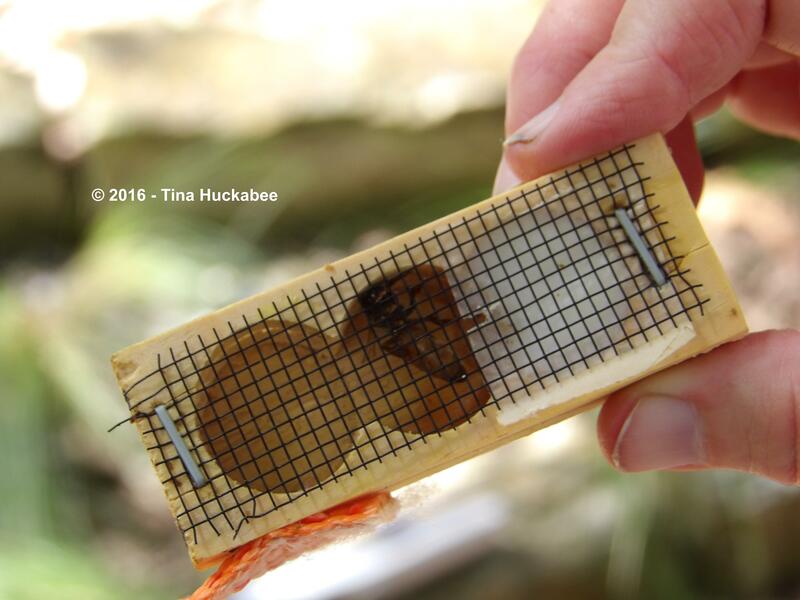 At one end of the queen cage is sugar fondant to feed the queen until she’s safely hived. The beekeeper pokes a hole in the fondant just prior to placing the cage in the hive so that the queen doesn’t work too hard eating through the fondant on her way to her subjects. 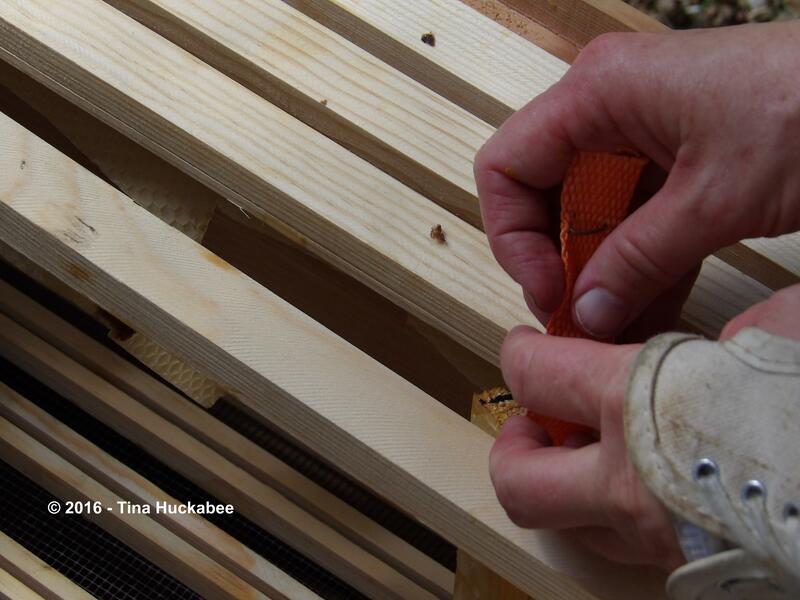 The orange tabs attached to the queen cages allow us to thumb-tack each cage onto one of the frames in each box. It usually takes a few days for the queen to eat through the fondant and join her girl gang. By the time the queen enters the hive, her pheromones are dispersed throughout the hive and all the worker bees love her so and will follow her to the ends of the earth. 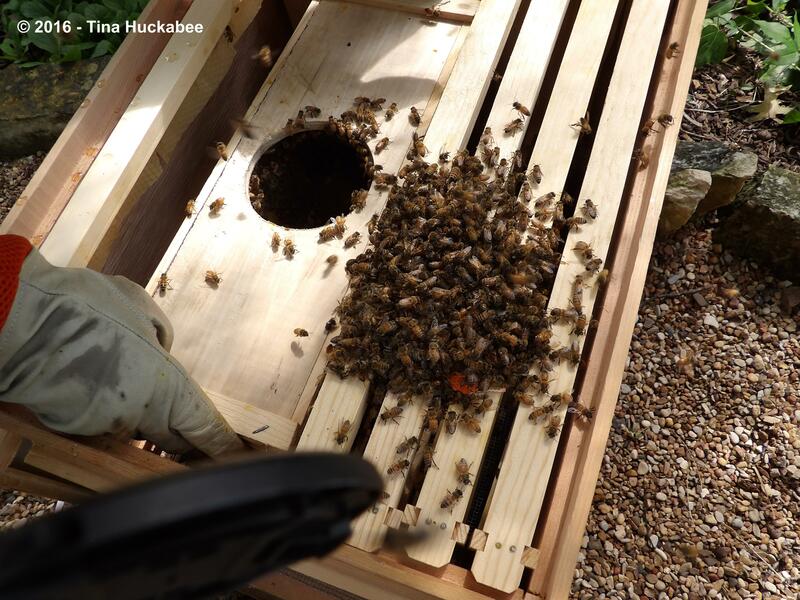 Once the frames are in, the queen cage attached, we pour some bees onto the queen cage. Then the entire traveling cage, with the rest of the ready-to-work workers, is situated cozily in the remaining open area of the box! 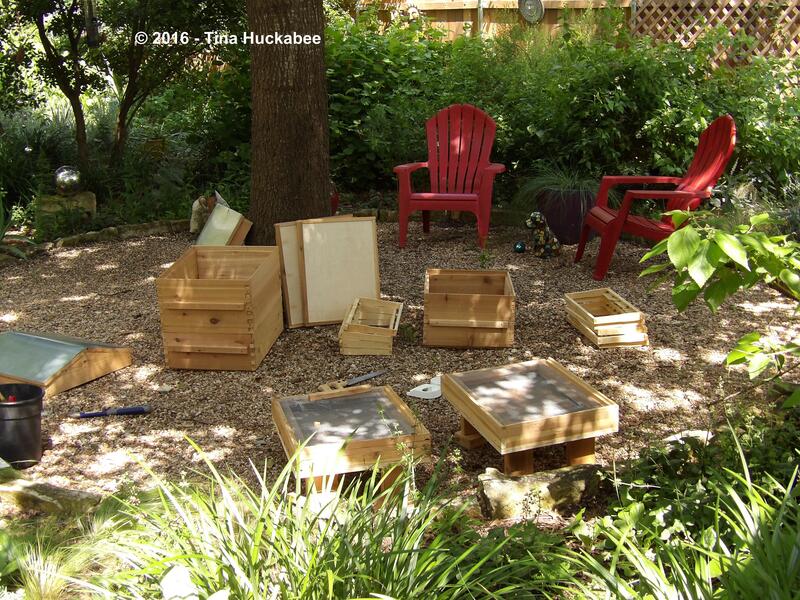 The worker bees will exit the traveling box and begin their work in the hive: building comb, taking care of the queen, foraging, taking out dead bees, whatever is required of each. …and added the roofs. Bee Mama sat for a well-earned break! Interestingly, later that afternoon, I was watching the hives and Buzz became buzzy–and loud. Bees vomited out of the hive. I left to fetch Bee Daddy so he could observe the mass exodus as well and when we returned, who was crawling around on the ground but Ms. Queen Buzz. Honeybees were swarming all over the area. We captured Ms. Queen in a glass and gently (you REALLY don’t want to squish your queen!) placed her toward the back of the hive. All the bees followed her directly into hive. If only humans could follow directions so well. 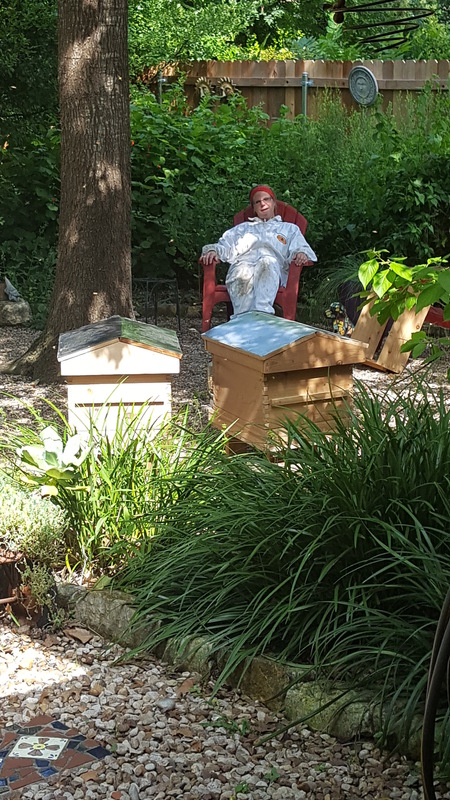 I suspect that initially we may have place her too close to the hive opening and she managed to find the door to the great outdoors–which is not good for a bee hive. 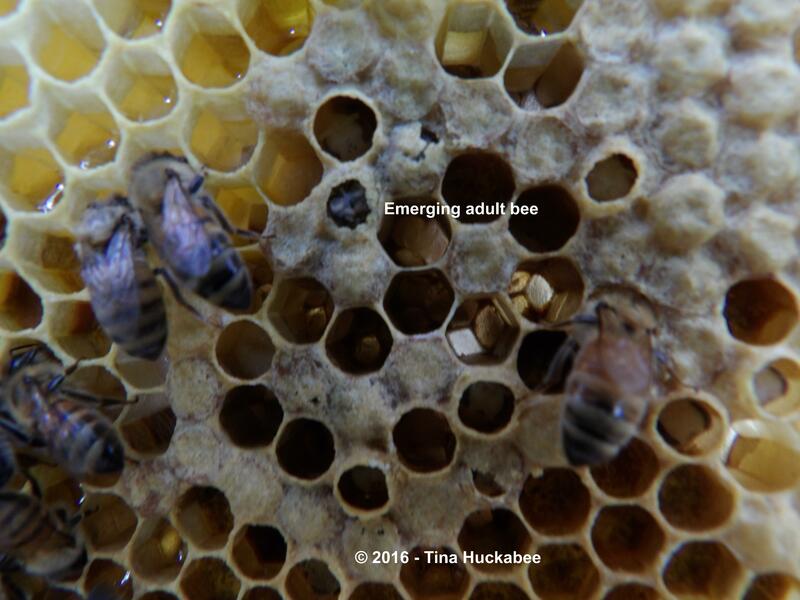 Since then, all seems well with both hives–they’re actively foraging and sipping syrup to augment their diet. 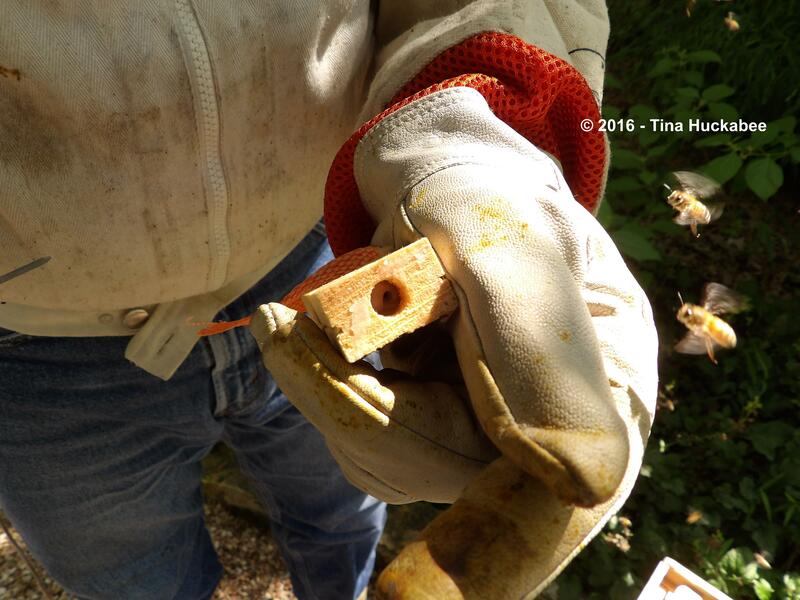 We’ve checked the hives twice since hiving and both queens are doing their job and laying eggs: there are larvae of different ages and even adult bees emerging. Bees know how to stay on task! We removed the traveling boxes and queen cages from the brood boxes a few days after hiving and added the remainder of the frames. There are still only four frames with any significant amount of comb, but there was more comb at the second check than the first–good progress. I’m still feeding the bees, though they’re drinking less from the feeders with each passing week. Buzz and Woody are the gentlest bees we’ve ever hosted. I think we could work them without smoke, they’re such laid back ladies. 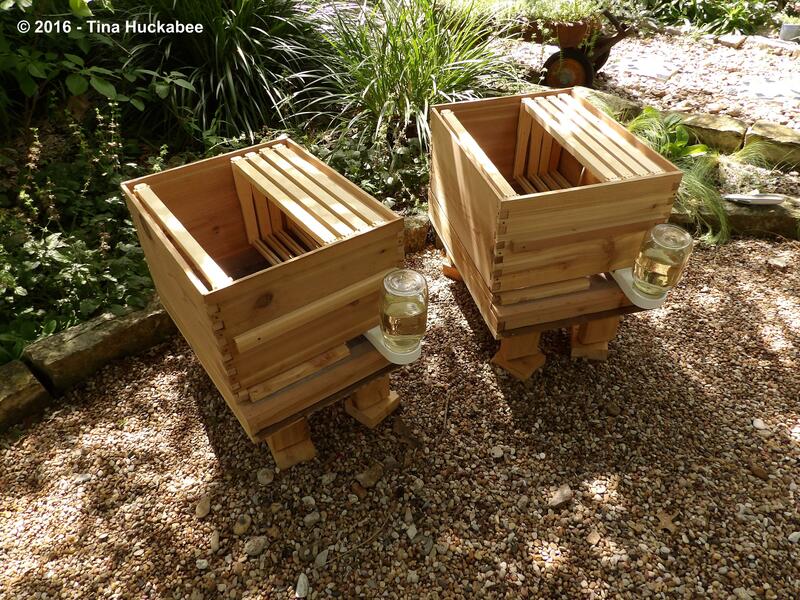 This entry was posted in Backyard beekeeping, Honeybees, Uncategorized by Tina. Bookmark the permalink. I can see us having bees one day, until then I’ll just enjoy yours. 🙂 Good thing you were there to see Ms. Queen Buzz escape and put her back before she took her colony off somewhere else. Good luck with the new hives! 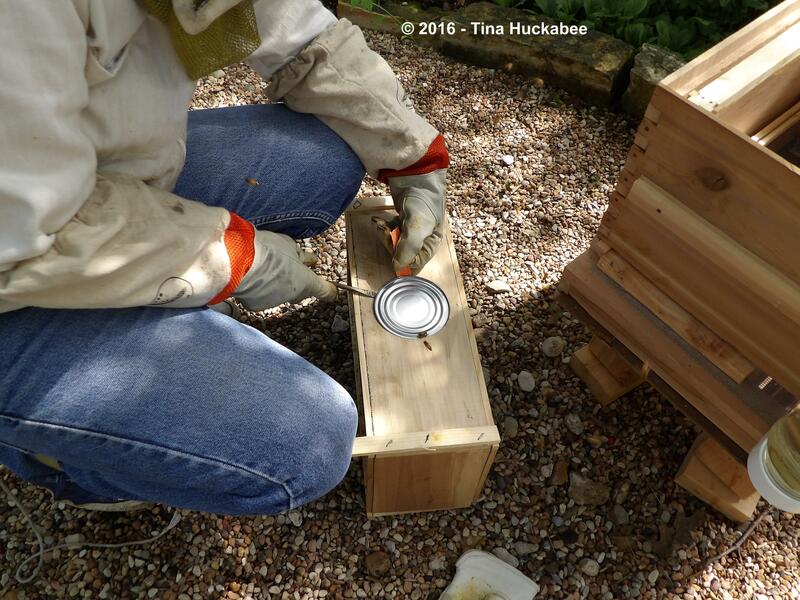 Thanks, Tracy–it’s been lots of fun, though at times, stressful and sweaty, this beekeeping thing. The queen actually has clipped wings, so she wouldn’t have flown off, but they would have wandered aimlessly in the back garden and that just wouldn’t have been cool. Do raccoons every get into hives? No, the raccoons have never been a problem. They get into the compost bin and occasionally, mess with one of my bird feeders, but so far, they leave the honeybee hive alone. It is wonderful to turn here and read such affirming natural news. I may be naive, but your hives help me feel more hopeful for all of us. 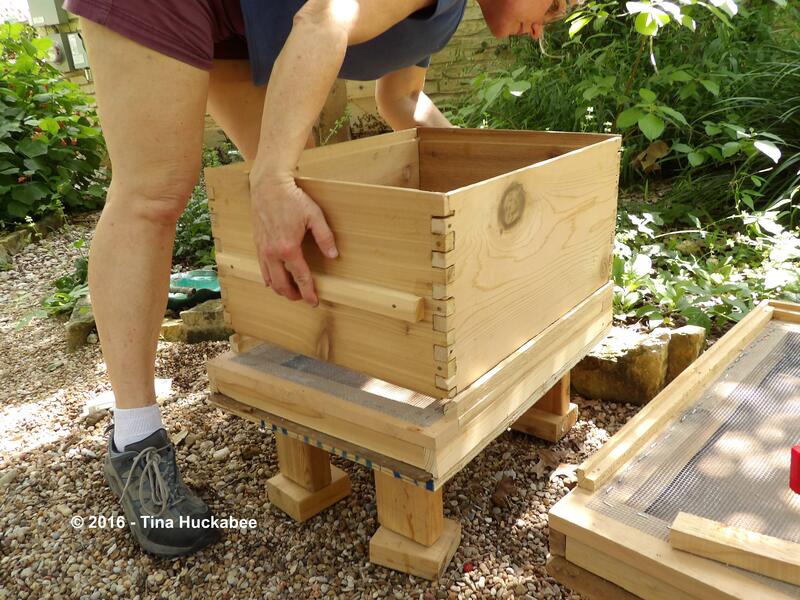 As to the “keeping” part of beekeeping – you two make it look easy but I suspect it’s not. Clearly your close eye on the situation forestalled an inadvertent Queen Bee re-enactment of Hepburn’s escape in “Roman Holiday”. Yay for two new successful hives and lots of Spring honey! (also Yay that Bee Daddy is healed from the Great Wreck of 2016!). It’s was weird seeing the queen on the ground. 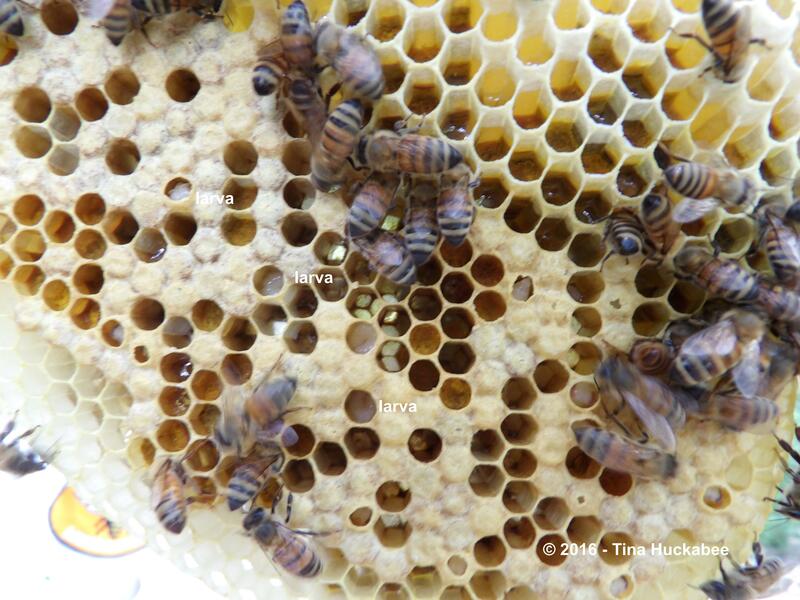 Other than when we actually hive our bees, I’ve not seen any of our queens–I just know they’re there, laying eggs. To see her on the ground was bizarre. I haven’t had time to get the new honey in jars, but it’s on the “to do” list over the next week or so–thank goodness honey doesn’t spoil. Bee Daddy is still recovering, though is mostly healed, but thanks so much for your good wishes. He needs to take up swimming…or something else. Best of luck to Buzz and Woody! I admire your work with honeybees, though it’s not something I can imagine myself doing. Those suits look too uncomfortable. Thanks, Jason. Yeah, the bee suits are hot. Tina muchas gracias por esta clase de apicultura. Ha sido maravilloso ver todo paso a paso con sus magníficas fotos y explicaciones. Me ha encantado. Le deseo lo mejor a sus dos nuevas colmenas. Que vivan muchos años y con mucha salud las generaciones de abejas. ¿Cuánto tiempo vive una abeja adulta? Es algo que siempre me he preguntado. Tina si me hiciera el favor de decírmelo me haría muy feliz. Que Papa Abeja se cure pronto. Y que Mama Abeja descanse y disfrute de la miel. Saludos de Margarita. The bees have been fun to learn about and we’ve enjoyed the honey–eating and sharing! 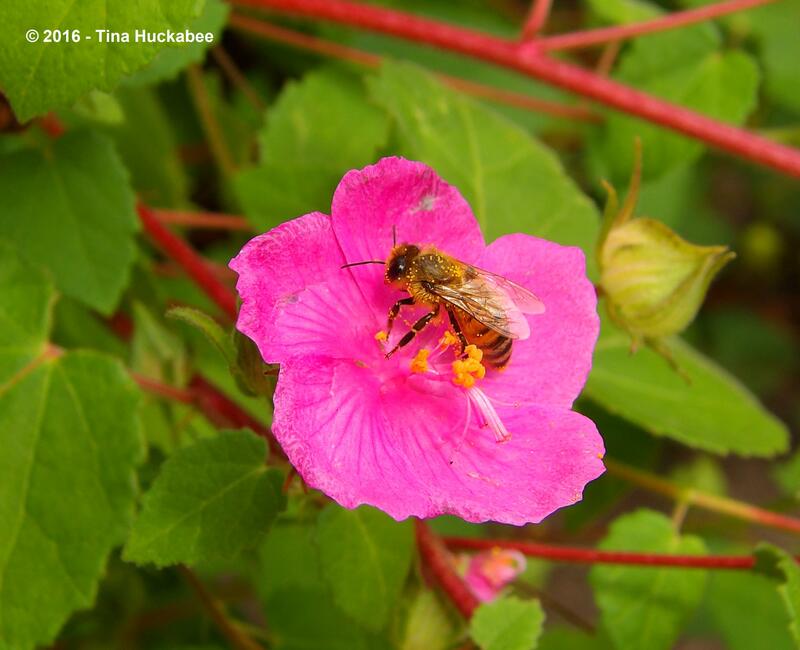 An adult bee lives about 6-8 weeks, except for the last ones of the season and they’ll live through winter. Thanks, Margarita! Gracias a usted Tina por la información. Me alegro que hayan disfrutado de la miel. Que sus colmenas sigan produciendo mucha miel por muchos años. Saludos de Margarita. So interesting! I knew pretty much nothing about bee-keeping, so this was a fascinating read. And nice to have photos of it all. Thanks, Hollis–so glad you enjoyed it. It’s been a fun adventure with the honeys. 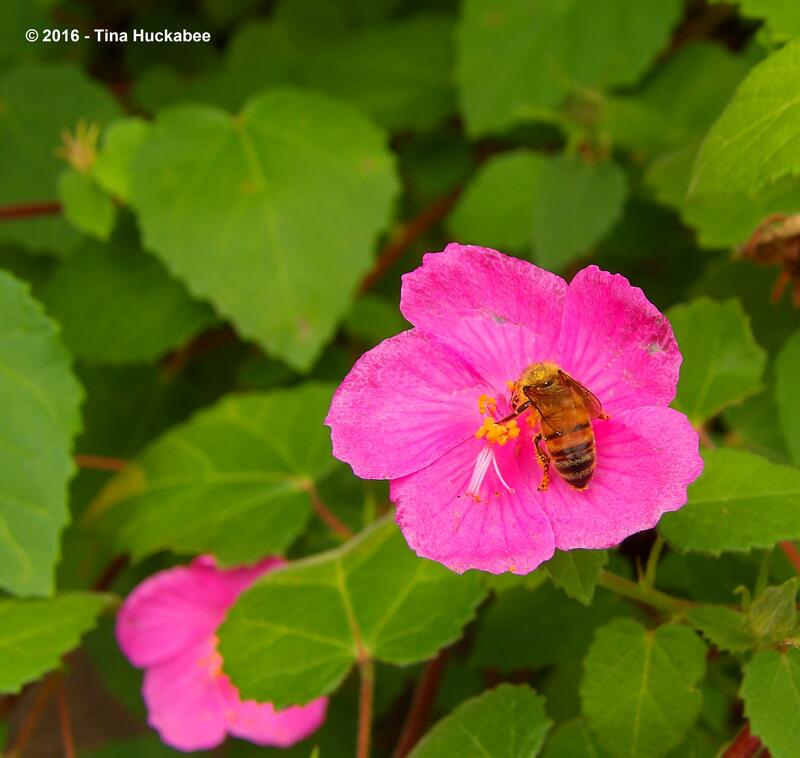 Darned HOA–they don’t like bees!!? I just love your bee tales! I thought about taking a class this year, but when I did a reality check, I decided I have enough on my plate. I’ll live with the bees through your writing and pictures, thanks! That is correct, so I would need electric fencing. We have seen 3 different bears within the last 5 weeks, one looked to weigh 400 to 500 pounds. They would do some damage! Fortunately, they haven’t discovered our (best year) black raspberry crop. There are 3 Apiary’s within 5 miles. 2 have fencing, the 3rd is located in a tiny village which backs up to a creek. Not sure why he doesn’t have fencing. He runs a 1 day beginner’s class the last and first Saturdays of May and June, he builds and sells hives, not sure about the bees. Maybe next year I’ll go, just for the learning experience! I hope you can work it out, somehow, Lauri, but those bears would be a force to reckon with. 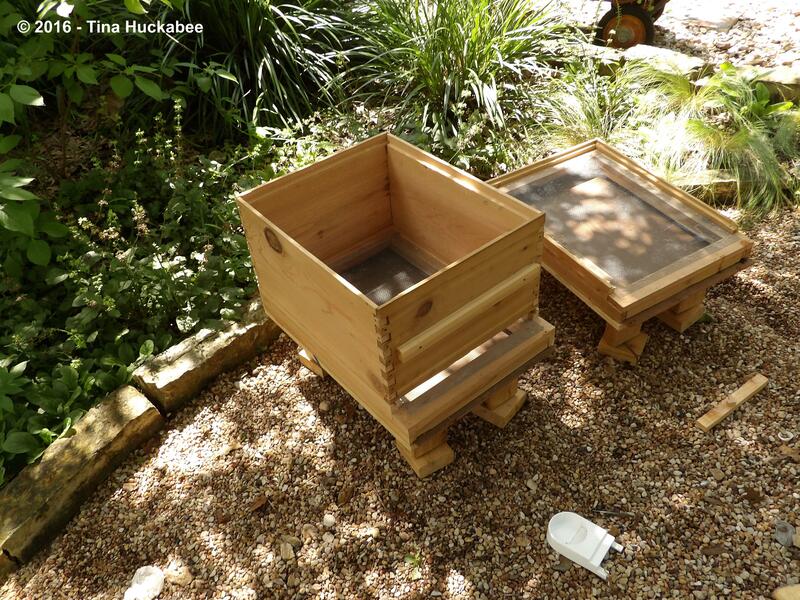 If it’s bees you want and not necessarily honey, you could build some native bee houses. 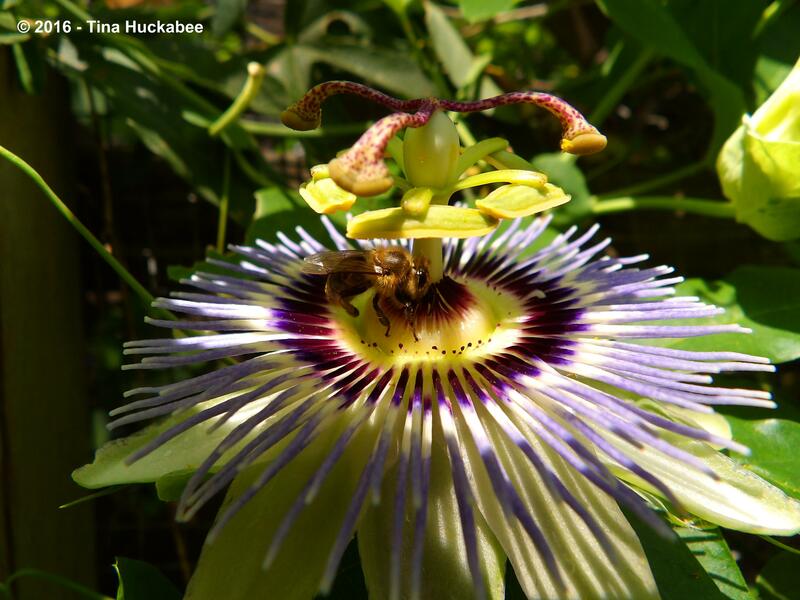 Native bees are even better pollinators than honeys. Think about it! What wonderful photos! 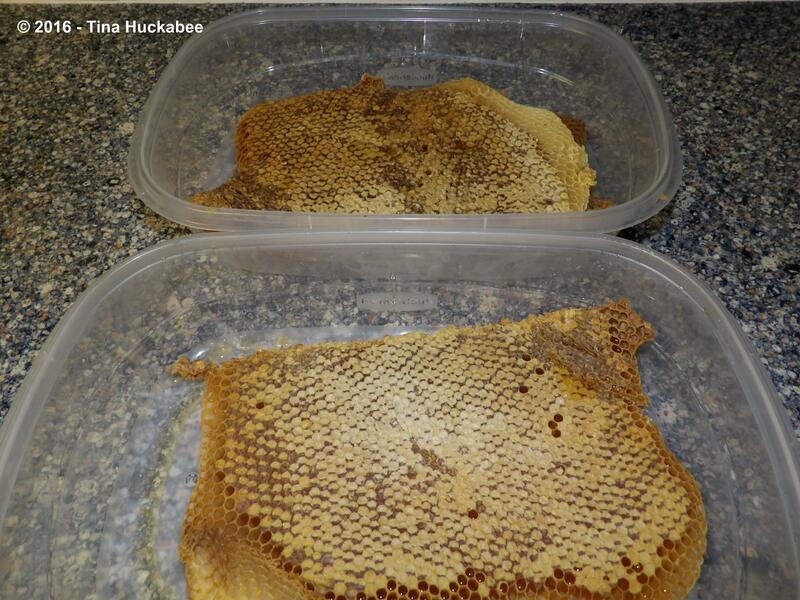 They are very singular looking hives and I love the no mess glass jars of syrup. Do they need it during this time of year? 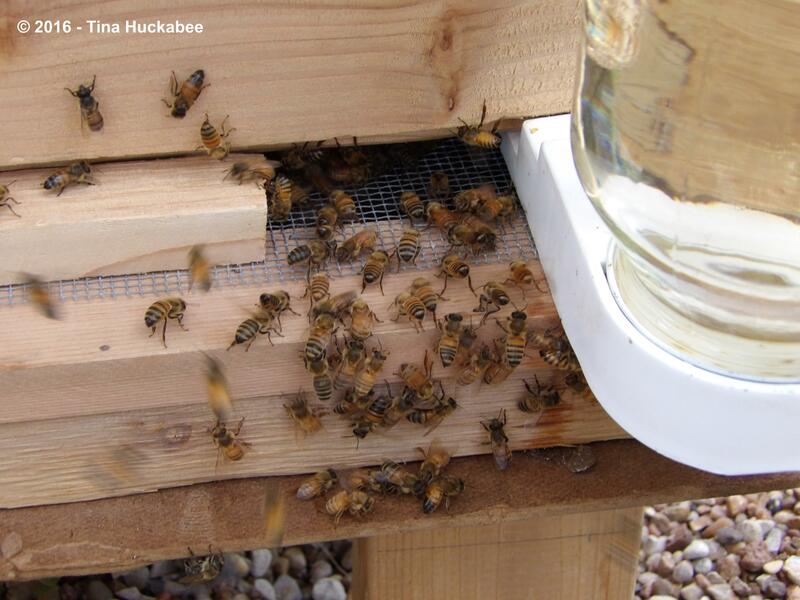 Normally, if we’d been able to hive in spring, I wouldn’t be feeding them still. But because it was so late in the season, I’m feeding for now. I’m not putting all that much in the bottles, because it’s so hot. But they’re slurping it up! Wow. So much detail. Thank you so much. I had heard the Warre frames are tricky to use. You were so lucky to catch that potential swarm! Have you ever run into Jack from http://www.austinbeehelpers.net/Site/Blog/Blog.html ? He also has gentle bees and feels that sometimes equipment isn’t even necessary. I LOVE that placement of hives. I can just imagine the wonderful smell of honey .. made in the shade.